Which is more important, a customer’s first purchase or their second? While obviously a customer has to try—and like–your product or service once before they’ll buy it a second time, the second encounter is crucial for developing loyal customers. By the time a customer has made that second purchase, they’re well on their way to becoming a regular. Here are some ways to encourage that second sale and establish a devoted customer base. What trends are on the horizon? How can I use them to help me create or improve my products? Are there people who want to buy my product or service, and if so, what’s the best way to reach them? How many potential customers can I attract? Who are my current customers? How do they like what I offer? Market research firms can provide the information you need or research it for you, BUT they usually charge thousands of dollars. 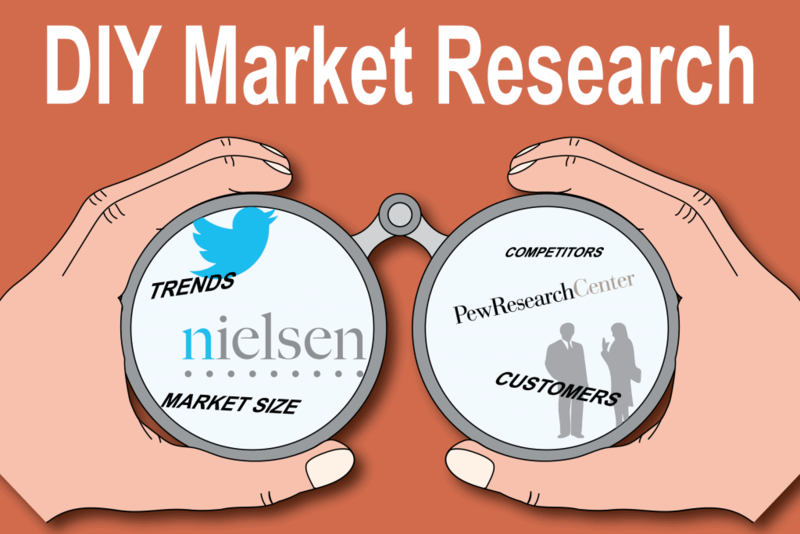 Here are some free and low-cost tools you can use for Do-It-Yourself (DIY) market research. Just having a website, however, isn’t good enough; your site should help you achieve your goals. Whether your primary goal is to attract customers, get newsletter subscribers, or let people know about your sales or daily specials, you need to know if your website is delivering for you. 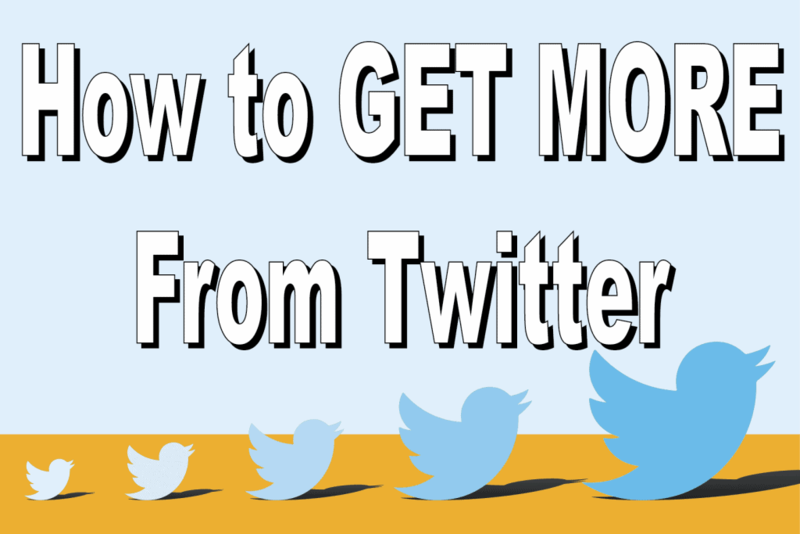 Facebook is the undisputed social media king and Instagram is the new queen, but Twitter is a quick, easy-to-master marketing tool for many small businesses, nonprofits, and consultants. It can help you increase your visibility, drive web traffic, build relationships with customers and prospects, position yourself as a thought leader, or just keep up with trends. Small, locally-owned, independent businesses continue to struggle as more consumers purchase products and services online, but here are three ways that business owners can succeed in our ever-changing environment. 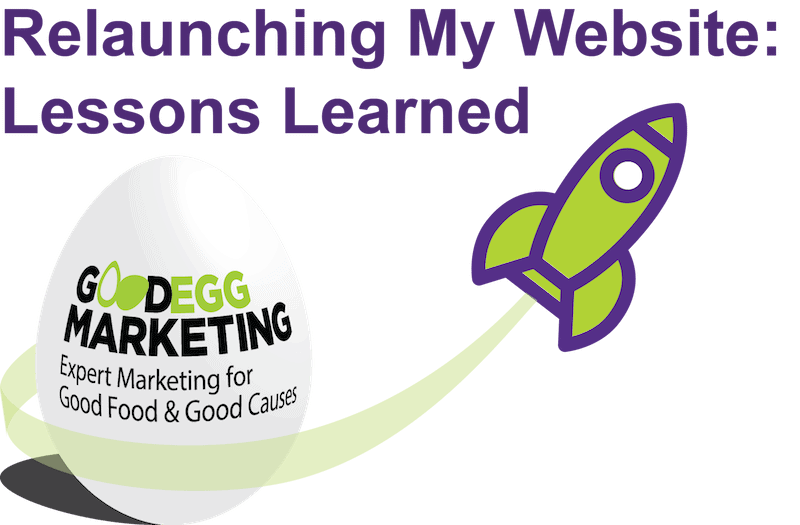 Good Egg Marketing specializes in building websites, so when I wanted to create a new site for our own business, I figured it’d be a snap. If I’d just wanted to give the site a facelift, but keep the same content, it would have been simple. But I was determined to create an easy-to-navigate site with lots of useful stuff and a fun, distinctive look. Admittedly, I was busy running my business, so I wasn’t working on the site all the time. But all in all, it took over two years to complete! Whether you’re starting a new website from scratch or building a new one, here are a few tips on how to create or relaunch a site, based on my lessons learned. Drive traffic to the site by providing useful content that people find on Google and other search engines. Over the years, I’ve written dozen of articles on a variety of business and marketing topics, but I never paid much attention to search engine optimization (SEO). 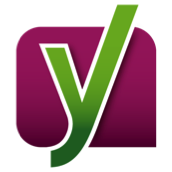 This time, I used Yoast SEO to help ensure that each article focused on a specific topic and keyword. Encourage people to spend time exploring the website by making it easy to navigate. The content on my old site was grouped by date and format—articles, newsletters, and presentations—rather than by topic. The site organization made sense to me—and no one else. The new site organizes content by topic and by audience, so visitors can find what they need faster. Encourage people to hire us by showcasing our past work. 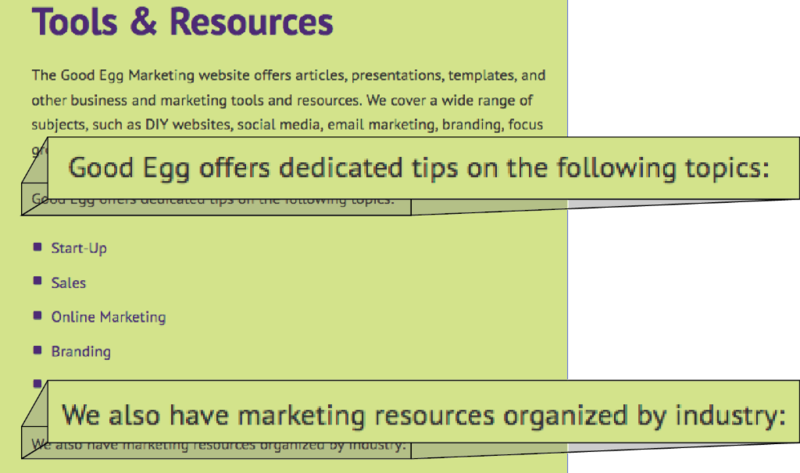 When most people visit the Good Egg Marketing site, they’re already interested in us, but need to be convinced that we can help them. I included testimonials, case studies, and a list of our speaking engagements and clients. The content showcases our expertise; our client roster demonstrates that people have confidence in our work. As I look at the analytics to see how people are using the site each month, I’ll be able to tweak it to achieve my goals. As a marketer, I’m always telling clients to put themselves in their customers’ shoes and address their needs. The websites for many marketing company websites lead with who they are, what they do, and how they do it. All important stuff to include, but not at the top of your home page. Our new site directly addresses frazzled business owners who feel overwhelmed by all their marketing choices. A series of rotating marketing tips complements a short video that expands on that advice in a friendly, informal style. The biggest challenge for the redesign was coming up with a distinctive look. Since marketing services are intangible, it’s hard to find an image that expresses what marketing is. I didn’t want to be yet another site featuring a photo of a flower or a mountain. After playing with a variety of concepts, including a recreation of my desktop strewn with tools of the marketing trade, I was at my wit’s end. 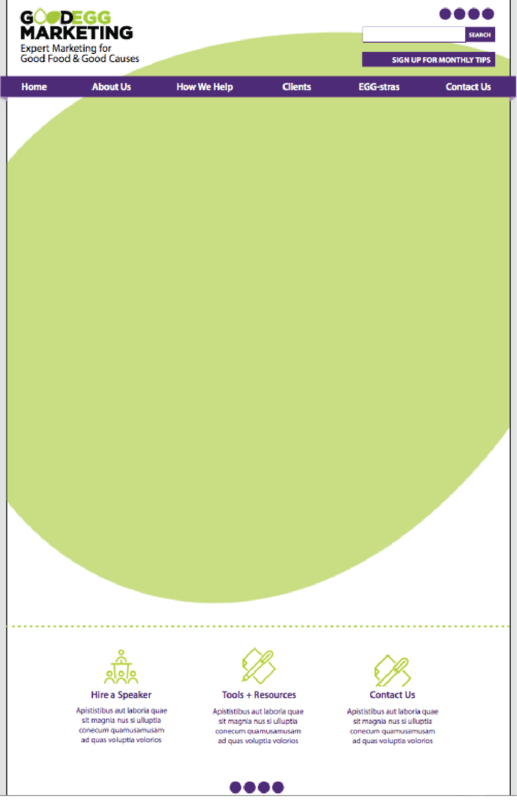 I finally went to a graphic designer I’d worked with many years ago and started with a clean slate. She interviewed me about my vision and ideas for over an hour. 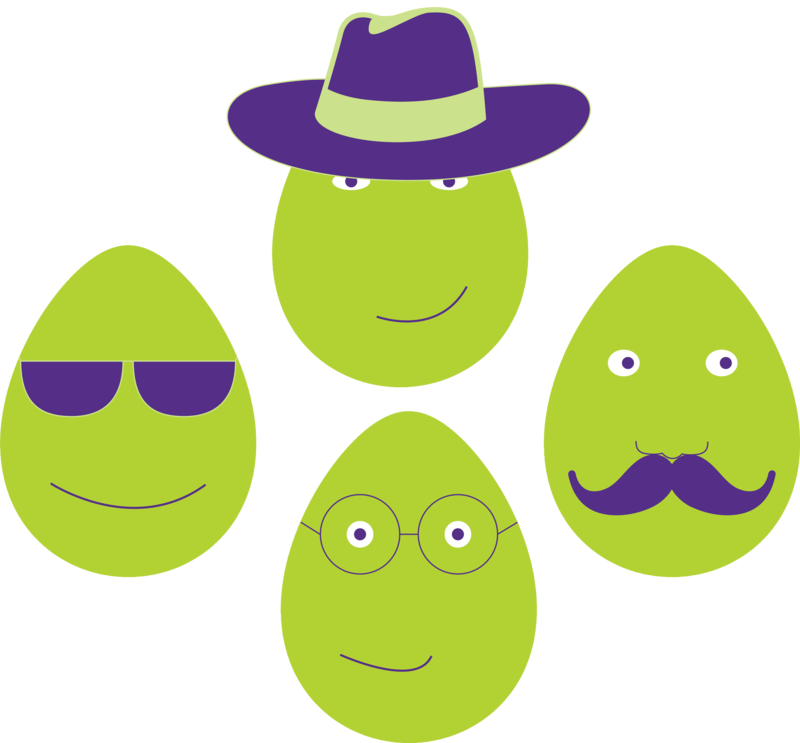 Ultimately, she came up with a dramatic, abstracted version of the Good Egg Marketing logo–a green egg!–that sets the tone for the site through shapes and colors. Once she created the basic look for the home page, I was able to write headlines and text that complemented those images and she created additional pages that built on the same format. My web developer was able to turn her images into a flexible WordPress design and everything else fell into place. I knew all along that my website needed to look good, load quickly, and be easy to use on a mobile device. These days, Google and other search engines penalize you if your site isn’t mobile-friendl­y. Unfortunately, I didn’t put enough thought into how the images would work on mobile when we developed the site. We created the desktop site first, meticulously tweaking it to get it to look just right. But when we looked at the site on a cell phone, many of the graphics didn’t line up correctly. We were using a mobile responsive design, but the graphics needed extra tweaking. 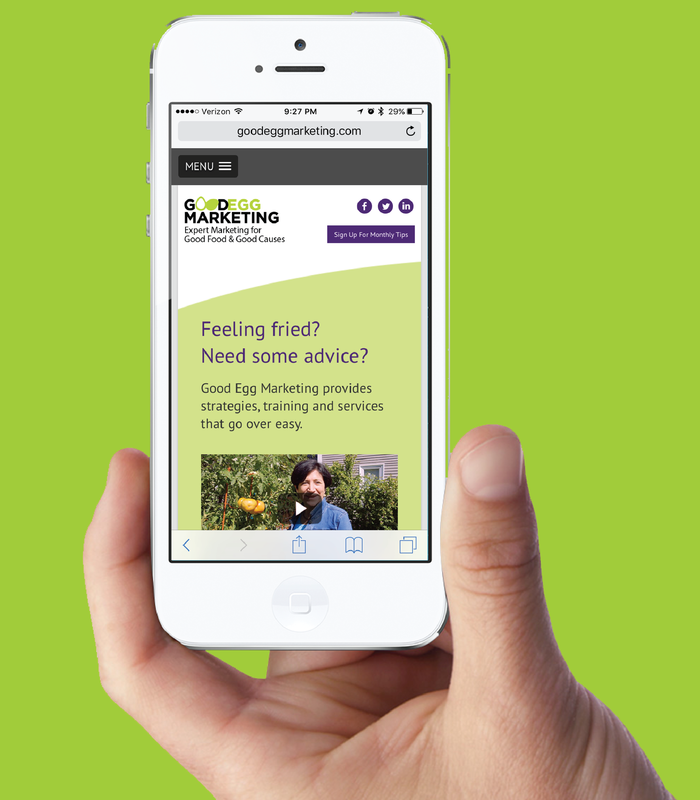 Ultimately, we were able to create an acceptable mobile version, but it required additional time and expense. 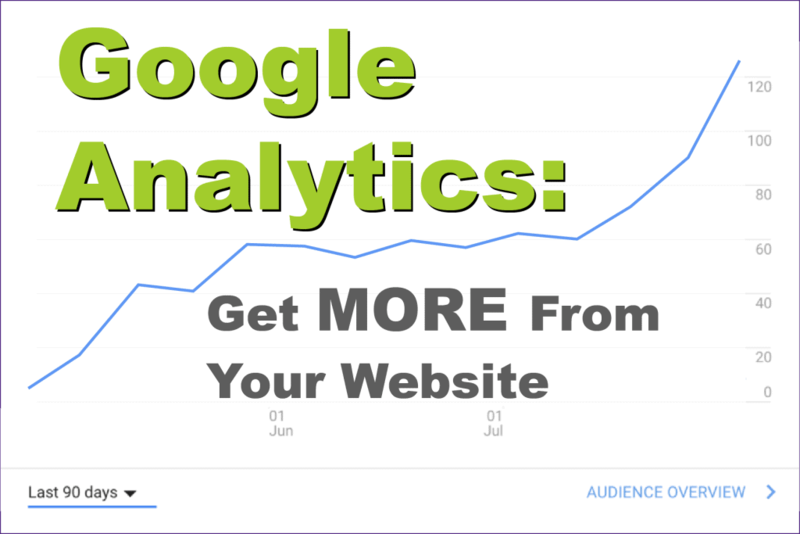 If you look at the analytics for your current site, you can see what proportion of your visitors are viewing your site on a desktop versus a mobile device. Even if you don’t have a lot of mobile visitors now, mobile will eventually take over, so you should bake mobile design into your site from the start. Just need a simple site with basic information about who you are, what you offer, and why you’re in business? If you have good computer skills and the time, you can probably create a website singlehandedly. There are plenty of free or inexpensive website builder programs that let you DIY (do it yourself) pretty easily. If you want to create a unique looking site or organize lots of content, however, don’t try this on your own! I managed the project and wrote the copy, but over the two years, I worked with two graphic designers, three assistants, a web developer/videographer, and a search optimization expert. Instead of bringing these talented people together as a team, I worked with them individually and sequentially. It seemed more efficient at the time, but in retrospect, putting a team together from the start would have saved time and money in the long run. If I were starting over again, I would also decide which project management, storage, and communications tools I wanted the team to use. We shared and stored some of our work on Google Drive and Dropbox, but we didn’t use them as consistently or effectively as we could have. In the future, I plan to use Trello and Dropbox for my personal projects, as well as with clients. A good website isn’t static, like a printed brochure. It’s a living thing that you need to keep feeding and buying new clothes. If you have a well-planned site, you should be able to adjust it as needed without needing a full redesign every six months. But, like fashion, web technology and design move so quickly that it’s inevitable that I’ll crave a new look eventually. When it comes time to build the new site, I plan to reread this article and take my own advice. Getting your product into a store or restaurant is exciting, but once you’re on the shelves, how do you make sure that you’re there to stay? 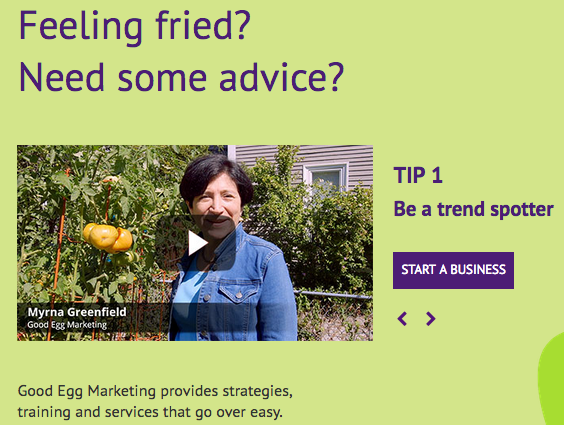 Here are some tips from a recent panel that Good Egg Marketing moderated at the Sustainable Business Network of Massachusetts (SBN) Local Food Trade Show in Boston, Mass. While this article focuses on farms and specialty food businesses, the principles about how to keep customers happy apply to most businesses and organizations. 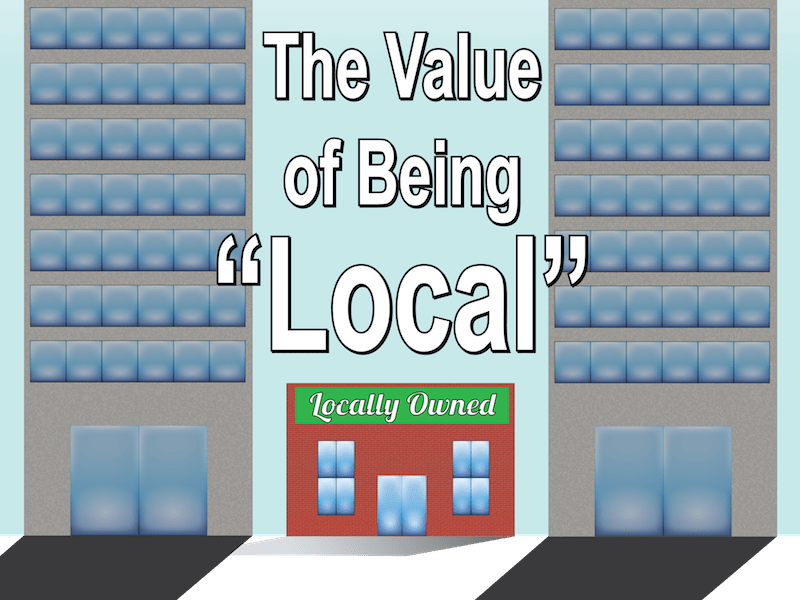 Despite intense consumer interest in buying local, getting your local food products into specialty food stores, restaurants, and institutions is challenging. Stores like Cambridge Naturals in Cambridge, Mass. get hundreds of requests a week to carry products. Finding a distinctive niche to fill is just as important for stores and restaurants as it is for the businesses that sell to them. There are gazillion salsas, cookies, and ice creams already on the market, yet new products get on the shelves every day. How? When New Orleans native Sherie Grillon moved up to Boston, she noticed that no one was making a fresh traditional Mexican style salsa fresca, so she started Nola’s Fresh Foods in 2011 to fill that niche. Being able to differentiate her product from other local salsas helped her get into specialty food stores and restaurants and she’s now selling to Whole Foods and Star Markets. Kryeski goes out of his way to work with as many farmers as he can, but with so many western Mass. farmers growing “so many great things,” he can’t buy kale from everyone. “That’s where the word niche comes into play,” Kryeski says. He gets the best quality and avoids overlap among the 200+ items he carries from more than 30 local farmers by taking the time to figure out which farmer is best at growing the products he wants to buy. Kryeski meets with farmers off-season to discuss what they’ll grow for River Valley the next year, so everyone can plan ahead. Cambridge Naturals has also been adept at finding a niche. They started out as a full-scale natural foods store in 1974, when the natural foods movement was just getting going, but by the mid-1990s, the industry had become extremely competitive. In order to survive, Cambridge Naturals rebranded themselves as a natural health store with a carefully curated selection of groceries. Their commitment to sourcing local, organic and ethical products, supporting the community, and providing excellent customer support has enabled them to thrive in the niche they carved out for themselves. The best places to sell your produce and products are where the owners, buyers, and customers care about supporting local farmers and food producers, not necessarily the places with highest annual sales volume. Stores like Cambridge Naturals pride themselves on being the first to bring in a new product, so they’ll go out of their way to support small, independent local businesses. Nola’s built its salsa business by establishing relationships with supportive stores. “We can sell four times as much at a small owner-operated local store than at the big natural foods supermarkets, because the customers know and trust the staff,” says Grillon. Community Involved in Sustaining Agriculture (CISA) in South Deerfield, Mass. was the first “Buy Local” organization in the country. CISA’s Local Hero Program Manager, Devon Whitney-Deal, works with over 425 farmers, retailers, specialty food producers, institutions and others who sell and support local food. She helps their members find the right venues to sell their products. “Be creative when you’re looking for buyers,” advises Whitney-Deal. For example, if you want to sell to institutions, don’t just approach your local schools, colleges and hospitals. Some local food producers in western Mass. sell to assisted living communities, because “their residents are demanding local food,” she says. Wherever there are eaters, there are potential customers. Creating and maintaining strong relationships with the owners, buyers, and customers is essential to getting in and staying in. Most buyers are sympathetic to new entrepreneurs, but they can be hard to get reach, because they spend so much time out on the floor, receiving shipments, going to trade shows, visiting farms, or talking to other entrepreneurs. And if you’re out in the fields, meeting with suppliers, doing demos, or selling at markets, you may also be hard to reach if they do call back. Figuring out how to get in touch with buyers–either when you’re making the initial sale or after you’re in–can be tricky. Some buyers prefer that the initial contact be made online or by email, others by phone, others by dropping by. While some venues provide information on their websites about how they want to be approached, in most cases, you often have to try a variety of methods to get a response. The right frequency for contact will depend on each particular buyer and your product. Some buyers want to be communicated with weekly or biweekly, others monthly, others every six months. Ask them how often you should contact them and the best times to reach them. Personal contact can make the difference. “I worked with one farmer who was having trouble selling her lamb,” Whitney-Deal recalls. “I suggested she go out to dinner and bring along a little cooler with a lamb step or lamb ribs to give to the chef to ask them to taste it. She did it, and sure enough, that chef called her back” and eventually became a customer. In addition to having a quality product that’s ready to sell, you need to have your samples, sell sheets, price lists, and business systems ready. “The days of writing invoices on paper are over,” notes Whitney-Deal. “You need to have computerized invoicing,” she says. Kanter suggests that companies invest in Customer Relationship Management (CRM) software, so they can track sales calls to current and potential customers. In addition, scheduling software can remind you when to make sales and follow-up calls. Visit stores and meet with buyers regularly to make sure that your products are stored and displayed correctly; that the owner, buyer, and staff know you and can share your story; and that you’re checking in to see what that store needs. In addition, you have to stay loyal to your initial customers. “Some of the specialty food producers do a lot of demo support right off the bat, but then they get into a bunch more stores and we never hear from them again,” Kanter says. Kate McKinnon plays a Russian woman surreptitiously donning a pink pussyhat as “Vladamir Putin” brags about the happy population in this Saturday Night Live skit that aired on the night of the Women’s March. Who would have thought that a pink hat could become a symbol of resistance? Symbols are one of the most effective ways that you can build your brand, convey a concept, or launch a campaign. Nonprofit marketing is the process of motivating people to do or believe something, such as donate time or money, make a purchase, change a behavior or belief, take an action, or become more aware of an organization or issue. Like for-profit businesses, most non-profit marketers seek to increase awareness and perception of their organization or cause, persuade people to believe or do something, and use their resources effectively. While not all of the tactics that companies use to market themselves will work for nonprofits, the main principles of marketing apply to both sectors. Here are the top three marketing components that every organization should use. 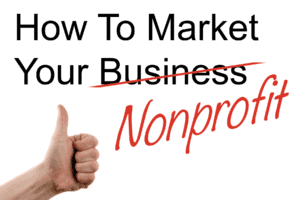 Continue reading What is Nonprofit Marketing? Many businesses, especially brick-and-mortar stores, do 25-30% of their business in the final two months of the year, then go through a serious sales slump in January and February. But if you stay focused on your customers’ needs, you can use the holidays to build a loyal customer base that supports you all year-round. Here are three “Don’ts” to help you increase sales during the holidays–and beyond. branding, focus groups, and more. We love to meet good eggs. on Facebook, LinkedIn, or Twitter. © 2019 Good Egg Marketing. All Rights Reserved.